This is a story about a young boy from Perak and an international mathematics tournament. It’s a story of overcoming adversity and the triumph of the human spirit. We hope you’re ready because this story honestly would make a pretty good movie. Reeno Chin is an 8 year old boy from Perak who was the second son of her mother, Wong Pui Si. He was also highly skilled in mathematics and was to participate in the Aloha Mental Arithmetic International Competition 2018, which was to be held in Russia this year. With us so far? As the day approached, Reeno fell ill. His mother stated that he was down with high fever and vomiting. Yikes. Apparently, it was so bad that she was considering canceling his participation and just letting him rest. But Reeno had other plans. He insisted that his mother let him travel to Moscow to compete in the competition. His mother relented, later stating that he has always been a determined boy. And so, they traveled to Russia, where he would take part. The young mathematician took on 70 questions and finished them in under 5 minutes! Actually, it was more like three and a half minutes! And with that, despite the high fever he had and the threat of vomiting hanging over him, he won the competition for Malaysia! He beat more than 1200 other participants from all over the world from over 20 countries to win gold and glory for both himself, and Malaysia! 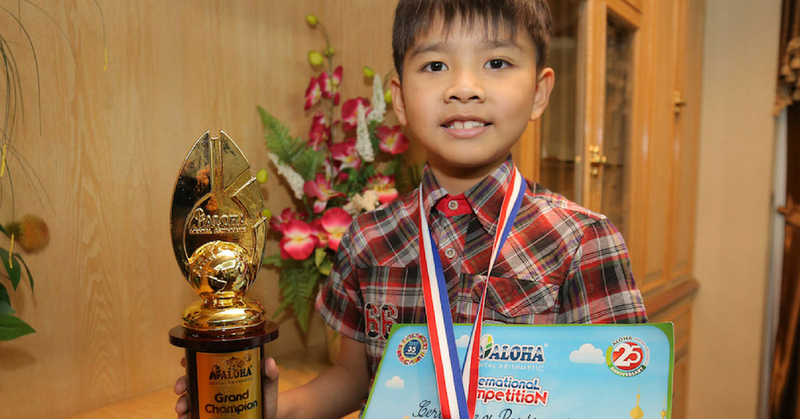 8 year old Reeno Chin has really raised the bar for the rest of Malaysia by overcoming such odds with sheer force of will. His trip to Russia cost RM5000 and was sponsored by the Perak State Government. The Education, Technology, Science, Environment and Information Committee chairman Abdul Aziz Bari further added an RM500 as incentive for Reeno. Abdul Aziz expressed pride due to Reeno’s achievement, adding that the state was ready to encourage the people in such matters. According to his mother, Reeno had always been interested in mathematics, taking up mental arithmetic when he was only five years old. And now at age eight, he has won big at the international level. We at Sevenpie would like to take this opportunity to congratulate young Reeno Chin and express our admiration for his perseverance and amazing math skills. Though we still struggle with splitting the bill using calculator apps but it’s great to know that the future of our beloved nation is in the hands of young people like Reeno whose intelligence is only matched by their dedication and tenacity. We wish him all the success in the future and can’t wait to see what he does next.